Family History Feast is a day of free information sessions for family history researchers at the State Library.It includes the annual Victorian Association of Family History Organisations (VAFHO) Don Grant Lecture. The event also showcases how the major Victorian government agencies for genealogical research can assist those researching family history. • The Victorian Association of Family History Organisations. Family History Feast forms part of National Family History Week 2010 and our seventh annual Feast will be held on Monday 2 August at the Library from 10am to 4pm. Watch the State Library of Victoria website (slv.vic.gov.au) for program details closer to the date! If you would like a taste of previous Feasts listen to podcasts of the past three events available through the Library website. Look forward to seeing you at this year’s Feast! 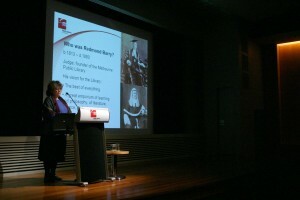 Anne Burrows has been Family History Librarian at the State Library of Victoria since 2000.